I lurked for months on Lumberjocks before making this purchase. Always the researcher, I had my reservations about some of the QC and manufacture complaints. I feel comfortable saying—as seems the consensus—the G0771z is a good bargain. I don’t think you’ll find a better saw for the money, and with the Z model, released at some point last year, you get the T-style B-meyer fence (the fence face does have 3 total tracks—2 on the face and one on the top). That was one of the main pain points on the previous iteration of this saw, so to have that resolved at the same price seems to be a relatively big upgrade all things considered. I purchased the saw on special through Grizzly’s website, not from a third-party seller. Shipment and scheduling were relatively low-hassle. The package came dented and slightly punctured, but the packing is fairly well done and efficient and the saw was unharmed. It sat for several months and the Cast Iron cosmoline prevented all rust. To those inexperienced with moving table saws, even with a ramp, these are tough to push (not to mention less safe) up even a couple stairs. Grab a friend. Saw and Fence are packaged separately. The saw is bolted to the pallet and to my eye, at least, this is not mentioned in the manual—so if you don’t want to throw your back out wondering why you can’t budge it off the pallet this is why. 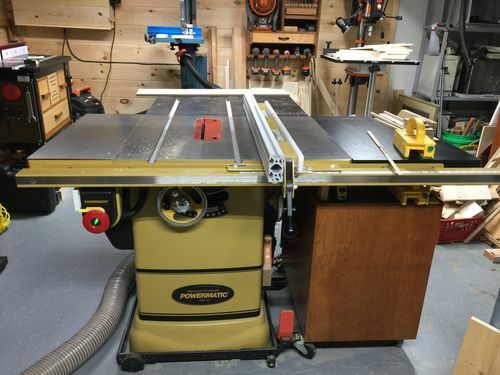 Placing Cabinet in portable Shop Fox stand (universal): I have a jet stand on casters that is far more flimsy than the ShopFox model—tradeoff is that this heavy duty stand takes an hour or so to put together. Miter slot parrallelism to blade: Factory was about .007” off. The manual recommends adjusting the cabinet-mounted trunions, however I loosed three of the table screws and used a deadblow mallet and the Woodpeckers dial indicator saw gauge through trial and error to get it to about .003” with the blade at full height. I think .002” is the range most people arrive at before stopping. I didn’t check the arbor run-out, but it appears minimal, with everything accounted for. Table Flatness: I’ve heard a lot of ranges on these tolerances. For the most part this stock number of saw was under .005” from various points, using a 36” Veritas straight edge rated at .0015 per the entire length. I believe mine (ordered Dec 31st during the Xmas sale) was the first or second batch of these if you’re keeping track. Extension Wing attachment: Each wing required one feeler gauge under one of the three wing bolts. The manual recommends using painter’s tape. I think that most likely that will be too thick. My preferred method: get a burner feeler gauge set and test those since they come in predefined thicknesses, or use aluminum foil and fold to get the desired thickness. Use a sawhorse, partner, or adjustable stand to put each wing (about 75 lbs, I believe) to the main table, and hand-tighten the bolts. If you have parallel clamps the spreader function will help you nudge the table up (y-axis and another set will hold the x axis (tops) flush. Place your straightedge across the mated edges and based on if the main table side of the edge rises, or its middle—and by how much—you can sense what kind of shim you’ll need when the bolt is tightened all the way. I got the edges both under .0015 where they mate, edge of wings to before the miter slot. I am in the same boat as many others here with the beveled edges not matching. One side is beveled differently, as you’ll see, but neither side matched their corresponding front or back edge. It also appears that the front and back of the table do not come perfectly flush, nor is the height of the wings in line with the height of the main table cast. This all seems to be aesthetic as the only operating surface is the table top and the rails rest far enough off the edge that it doesn’t seem to throw of the alignment of the fence tracks. Fence System: Having never used it’s precursor, this fence seems to be a wholly aluminum, light-weight version of the Besisemeyer (sic). There is a tube and two faces attached by three screws to a t-track halfway up the height of the about 3” tall fence. Mine came cupped, on both sides, much to my dismay. Customer service (Doug) has been helpful thus far on sending two new sides out. I’ll report on that as I receive the replacements. This was the only aspect of the machine out of order. The front is evocative of others in this T-square family. It seems relatively lightweight and like it will bend eventually. The lock down is good—achieved by pushing the handle down—and adjustable in terms of pressure. Mine doesn’t wander off parallel or to the left or right on lock down that I’ve noticed without exposing it to stock. That, of course, is the operative consideration. Hopefully, it would stay this way under pressure. With the set screws I was able to get the fence squareness to within .002-3” of the miter slot and stopped there. Not sure how much further I could have gone. Due to the cupping, it is not square to the table. The set screws are intuitive. To there a set for height/square to table and one for parallel to miter slot/blade. 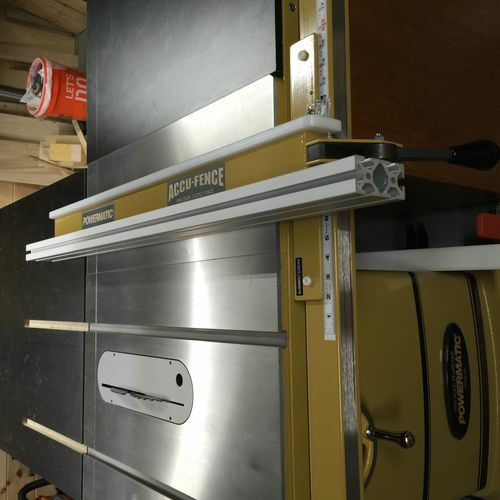 I have an Incra fence for my router table and am heavily tempted to go with an aftermarket as, although, this fence seems functional enough for my purposes (assuming the replacement faces arrive flat), I can’t shake the desire to upgrade it—even though it means eating a $250 cost or so. The incra extruded aluminum, though—I’m not sure how much better it is. The extruded aluminum might be solid on that and hollow in this case. Overall, this product is about a middle of the line—higher if you stack it against 2HP saws (where a Sawstop or PM would beat it out with their in-class entries, respectively). I’ll echo what has been said many a time for good measure for people looking at the market: to get a better saw you’re probably looking at $1,200-1,300. For its price-point at $800, I can’t see how you can arrive at a much better saw than this, though. Things generally are good enough to the discerning hobbyist. The motor is a 1.75hp (this or a 2—I think they market as a 1.75) and I have thin kerf on the way. Exposing it to 3/4 ply it cut smoothly with the poor factory blade. I’ve read reports that people have no problem with 8/4 hardwoods at a reduced feed rate. The on/off switch and housing, along with the wheels, are a hard plastic, and let you know what price range you’re dealing with. 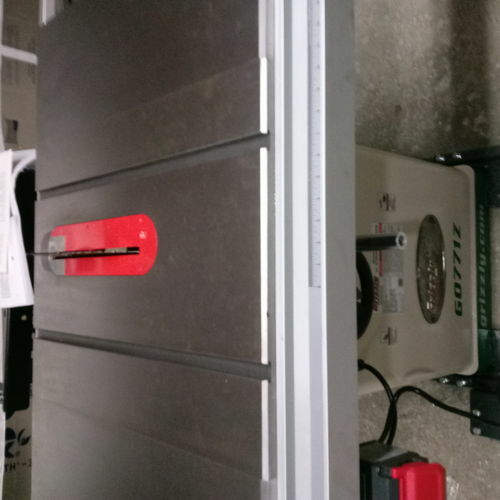 Being in the presence of the saw, in general, will tell you that this isn’t for a professional or particularly serious shop, but you also come away feeling good about the purchase, and that it will last for a good enough number of years. It’s 110/220 adjustable. I have a 15 amp circuit in my garage (one reason for not jumping a tier up—I’m also in a rental property) and with even a 15,000 BTU, 12 amp draw on max standing AC unit it won’t trip the breaker. I think this is rated close to 15, but if you’re worried about a 15 amp circuit, I would be surprised if you’ll have problems with this unit. When you compare the quality with the cost—and assuming you get the parts as intended with good quality—it’s in that 4 star neighborhood. I would buy again with my circuitry limitations (in the ideal shop I’d go up a tier), and do recommend. Feel free to ask me anything about the saw. And meanwhile, if you have recs for an aftermarket fence—I’m hedging my bets. I’d also like to hear anyone’s thoughts on cup in an aluminum fence of about .006” when the top and bottom are flat to each other—how big of a problem could this be? Would trued stock ride the top and bottom? Thanks Ottacat. That’s on the list. One thing I’ve wondered is what distinguishes Grizz’s extruded aluminum in this case from VSC’s? I imagine VSC’s has to be better than this stock one, since Grizz’s is just a knock off clone of the VSC and cabinet maker mule and others that use an aluminum fence with t tracks. I will also say that those JessEm stock guides they market make my heart skip a couple beats. Those seem like they could be a boon to a table saw. I have the JessEm guides on my saw and love them. I use them on almost all rip cuts and they give a great cut finish and greater safety. Very easy to set and use and they fold up out of the way when not needed. I just ordered a pair of the JessEms today—just too appealing. For those who are interested, there is a section about post-extrusion flattening using CNC on VSC’s fences on their webpage. After some more time with the Grizz stock fence on the 771, looking at compatibility with the JessEm and slide in t-buts, I get the sense it might be far less robust than the VSC. Interesting. I recently wrote a review on this same saw and it seems that a few things are different. I noticed one of them in the picture. Your fence rails mount a few inches to the left of mime. Also, my wheels are aluminum, not plastic. My manual also directs you to adjust by loosening the table bolts and says nothing of adjusting the trunnions. You mentioned that you got yours back in December. It seems that they must have made a few changes to it since then. For the most part though, I agree with your review. I’m completely enjoying this saw. And FWIW, I see no need at all for upgrading the fence. I think they might be (largely) the same and I goofed. The handle is, and it looks like the wheel spokes might be, aluminum—I had took note when assembling that the knob and the connector seemed to be plastic and applied that to the rest. You’re also right about the table—I don’t know where I read that. My manual is the same as yours so I must have been thinking of something else. My rails don’t line up; I had moved the front to line up the tape “0” with the blade. The back has the pre-drilled slots, as you know, but the front attached via the t-slot so you can adjust. Do your rails line up to the right? I feel like others’ do in pictures. I like the fence base. Not having experience to speak from with many other fences, that component seems pretty hefty (at least for the price?). The fence face for me seems a bit light and mine wasn’t flat. If it was flat I probably would keep it straightaway. They’re sending a new fence face (they were great about this, btw) so we’ll see. I also was told that the very super cool fence base doesn’t fit on these rails, so the most I could do is attach their VSC aluminum face to the fence base if Grizz sends me another cupped fence. No problem. Thanks for clarifying. My rails do line up to the right. I think I did the same thing as you at first and then realized that the 0 on the rail should be about 6-8 inches to the right of the blade so it lines up with the right “window” on the fence base. You can see how mine lined up in the review that I did here - G0771Z. I bought the fence face from very cool super tools and attached to my stock fence with no problems. Make sure you buy their bolts too. Get extras for jigs you might make.